Gardening is such a year round thing isn't it? Gardeners are always anticipating and preparing for the season ahead, almost as part of enjoying the current season. Thoughts of spring can help one sail through winter just fine. Oh yes, totally agree! It's almost a relief to clear the garden, wiping the slate clean so to speak, and plan for another year of what to grow! I bet you two are super excited for next year with your new jungle hut and refreshed garden! We are always looking towards the next thing aren't we whilst looking back at the season we have left behind. I agree, Sue. It's a great time to tidy up after the excesses of autumn lushness and to plan ahead. Personally, I'll be pruning my seed box for starters! The grasses in that last photo look good in the sunlight. Thanks, Mark - it was quite harsh light to be taking photos but, as you well know ;), we sometimes have to just do what we can and hope for the best! I think the long shadows help to give an autumnal feel to the pic! Glad you like! The grasses are looking glorious too. I haven't grown those Chinese lanterns before, I hear they're invasive, but how intricate they are as they decay. Thinking of giving them a go in a pot next year. They can look quite messy as they fade away, Rusty, but I was very taken with them in Sarah Raven's garden this year as she's trained them through shrubbery - most effective! Once they've started to fade to a pulp, I think I'd pick a few for a vase and then clear them. Pick most of the lanterns off if you don't want too much self-seeding going on next year! Beautiful, love that last photo. That pink is such a summer colour, the same colour as my allotment rose. Now it's autumn it will soon be gone I think. But as you say, it has already begun again in the garden. Garlic and onions coming up. To me, they are the beginning of everything. Thanks, CJ. I think remnants of summer colour are what we cling to in autumn, knowing that it will all soon be gone. I'm amazed that there's still a good dollop of colour in the garden but frosts and low temperatures are promised for this week so this could be it for the garden! PS. Well done for getting your garlic and onions in - I've still to do mine but will protect with a bit of fleece, I think, as minus temps forecast! I like to eat chinese lantern fruits. I plant the green type. They grow wildly, sometime grow as weed. Its well known as medicine plant here. Hi Endah! Yes I grew the green physalis in the veg garden this year and had one or two tasty fruits before someone sat on my plant and broke it! This is a different plant and not edible - we have to be so careful, knowing what can and should not be eaten! The photo of the Chinese lanterns makes the skeleton look like gold filigree work- stunning! Must give them a try. 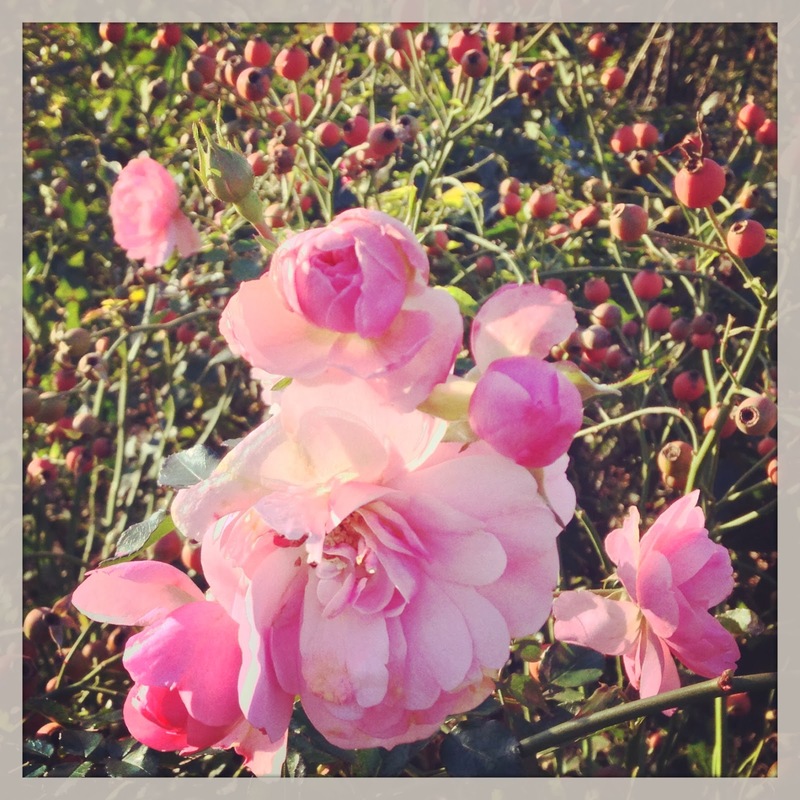 Your last photo is also beautiful, a lovely garden and the the work that goes on all year round. Thank you, Pauline - glad you like the photos! From a distance the physalis does look a bit tatty but I like to see the beauty in small things as well as large - and sometimes it's better to screen out the tatty clump!! As Capel gardens are open to the public, there is a lot of hard work that goes on 'behind the scenes' - always busy, as in our own gardens!! We always think of spring as the busy season but there's really lots to do the whole year round. I love Chinese lanterns when they turn to lace, so pretty and delicate. I had one in the garden a while back but lost it, it can't have liked where I planted it. Gosh, yes Jo! In the veg patch I'm still clearing away and tidying, planning to dig to plant more fruit trees - as you say, the work goes on! The chinese lantern is on our next Capel plant ident and I've learned that they really like a position in full sun or very dappled shade - perhaps yours was a bit too shady? They're a lovely splash of colour in autumn and grow very easily from seed so perhaps one will reappear in your garden in the future! The rose is very pretty, but that photo of the barrow is gorgeous - the grasses, glowing in the low sun, so alive, defying you to think that this is the dead season. I have chinese lanterns on my list to try somewhere when I can work out where - a job for a dull December day, working through the wishlist and culling it to a manageable seed list. Thanks, Janet - that last photo is my favourite too! Grasses are such good value in a winter garden as they don't need to be chopped back until spring and then - whoosh - up they come again, but in green! As part of my course, I've been learning to choose plants for garden designs and a rule of thumb is to write a list of all the plants you fancy, cut it in half and then double the quantities of the final selection. As a plant lover, it's the hardest thing to do! 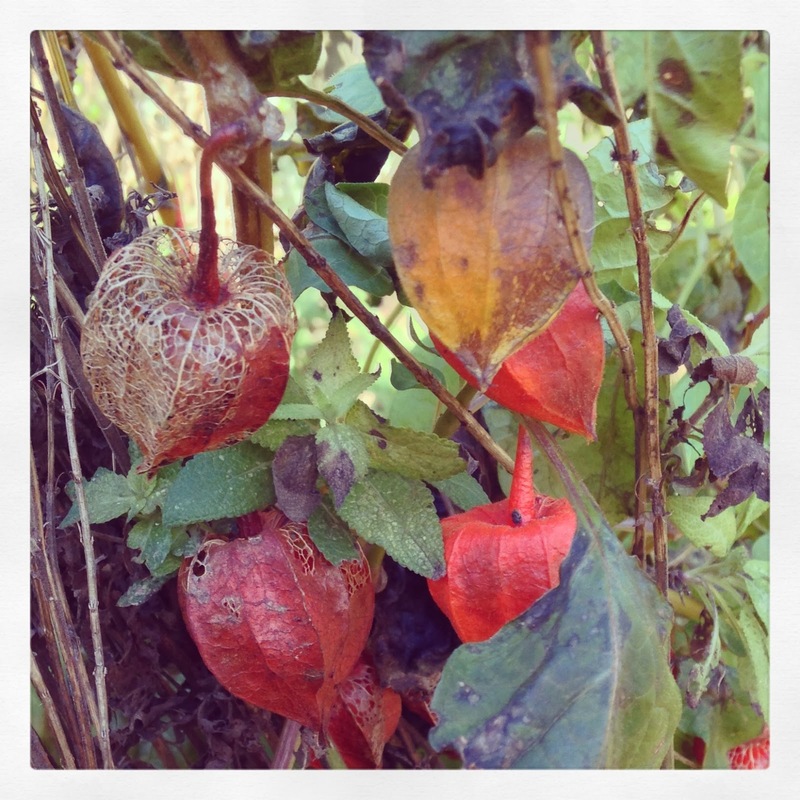 Could you try training any physalis plants up through twiggy winter shrubbery to get the full effect of the lanterns? Absolutely, Anna! I'm always looking forward as a gardener - we have to, don't we, to make sure our seeds are planted on time! I used to find winter quite gloomy but the promise of spring seems to make the worst months zoom by! I think that I am being followed by Chinese lanterns. Whenever I move a plant from one border to another, a Chinese lantern arrives. Even when I move house, one follows me. Two years after moving to Norfolk I discovered a clump in a brand new border. It is as well that I like them, because I have never knowingly planted one. Lovely shot of the border and barrow ! Gosh, that's so funny that physalis is a plant that follows you! It's not that usual to see them growing in people's gardens either! I'd love to put some into the gardens at York Rise but a lot of the borders are quite shady - the answer is, of course, to just give it a go and see what happens - I seem to be getting quite good at invasive self-seeding plants! The skeleton of the Chinese lantern looks like gold filigree, beautiful. I've never tried growing them but might give them a try for their autumn interest. The flowers come in around late June, Pauline, so I think they have quite a long season of interest. I hope you do grow some, I love to see photos of your garden!